SA28039 - Carved Wood Sign for" Gear to Go Outfitters" Store. 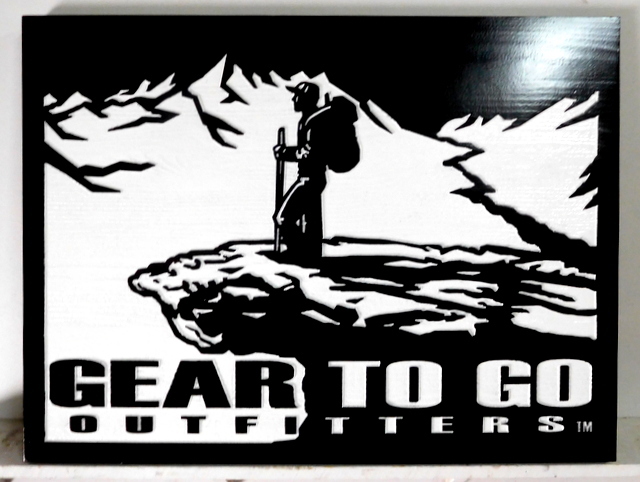 Above is a carved wood sign for "Gear to Go Outfitters" store. The text, artwork (its logo) , and sign borders are carved in 2.5-D (raised or recessed in flat relief) and artist painted with long-lasting sign enamels. The sign is completely waterproof, and is clear-coated twice for UV protection. This sign can be mounted on a wall, displayed in a window, or hung from a ceiling beam or wrought iron scroll bracket. To view many more retail and business signs in Gallery 28A, please click on "Return to List" below right. "Return to List" below right.